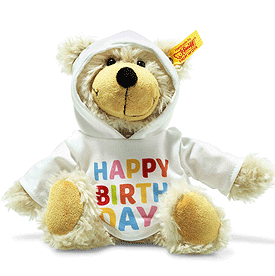 Steiff Charly Happy Birthday Dangling Teddy with Hoody is made by hand, in the finest beige cuddly soft plush. Charly is 23 cm tall and made of soft and cuddly beige plush fabric. His face and soles feature a caramel colour while his little bear nose is black. The line below his nose and his mouth are embroidered in black. He can remain sitting up straight thanks to bean bags. Charly is thrilled to be dressed in his cream-coloured hoody, which can be removed. The hood has openings so that the Teddy bear's ears can poke through. The words HAPPY BIRTHDAY are printed on the front of the hoody, along with a birthday cupcake with candles.